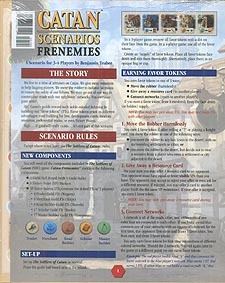 A scenario for 3-4 players. We live in a time of altruism on Catan. We give away resources to help lagging players. We move the robber to isolated locations to ensure the safety of our fellows. We even go out of our way to connect our roads with our neighbours' networks. Has everyone gone nuts? Ah! Catan's guilds reward such noble-minded behaviour by handing out 'favour tokens' (FTs). Favour tokens grant us different advantages: road building for free, development cards, random resources, preferential trades, or even Victory Points. Sigh! If goodwill really exists... it's not part of this scenario. You will need all the components included in The Settlers of Catan game.